The world is slowly beginning to focus on sustainability and this is a great thing. Many cities are now ‘Going Green’. Proof of this is the continued and growing list of the green cities in the world. But, what makes a city Green? How does one determine which is greener than the other? And how do worldwide organisations come up with the greenest of them all? If you think of a green city in terms of recycling programs, bike lanes, ample green open and public spaces like community gardens and parks, then the list below is surely going to amaze you. These top greenest cities have made it onto this list because they have been responsible for fighting the battle against climate change to the highest level. These cities do not just claim that they are ‘Going Green’; they do so through numerous large-scale efforts that set good examples to the rest of the world. According to the Global Green Economy Index (GGEI), “green cities” can be measured by 32 indicators in four broad categories: ‘Leadership and Climate Change’, ‘Efficiency Sectors’, ‘Markets and Investments’, ‘Environment and Natural Capital’. Although some of the cities mentioned did not make it on the GGEI 2014 Top 10 list, cities in our list have been chosen for 2015 because of their commendable utilisation of renewable energy, promotion and support of green lifestyles, endorsement of green laws for the protection of the environment, and their use of innovative strategies to accomplish their goals for greener communities. Impressively, Oslo managed to be the greenest in the Norway despite the fact that it is also one of the most populated. Oslo, is indeed a very attractive city for tourists and despite the continuously increasing number of residents, it still manages to sustain its objective to stay green and make use of innovative sustainable methods. Oslo was even named the world’s second greenest city in 2007 and many other European cities are following suite and adopting true sustainable practices for better quality of life, not just for their local residents but also for their visitors. Long before the other cities decided to join the wagon for sustainable earth, Oslo had already made its own mark on worldwide environmental concern.When it comes to greenhouse gas emission, it is a well-known fact that Oslo has the lowest in Europe.This is thanks to the full cooperation of the population and the guidelines given by the government for each new building developed to promote energy efficiency.Additionally, it is worth mentioning that 85% of the school children in Oslo either walk or ride their bikes to and from school. Local commuters also make use of hydroelectric-powered public transportation. In continuing with their green efforts, the Norwegian capital is aiming to effectively and completely phase out fossil fuel use by the year 2020. In 2010, this Swedish city was named as the European Green Capital due to its high commitment to sustainability and has always been renowned for its green efforts. Stockholm’s very first attempts to be environmentally conscious started during the 1960s when a big campaign to clean the abundant waterways was launched. Today, rivers have been revived as proven by the edible salmon that swim in the city river. Just like Oslo, Stockholm is also one of the European cities with very low carbon emissions at a mere 3.4 tons/capita, where the average is 10 tons/capita in other European cities. Stockholm is always working to better its green initiatives with plans to prioritise other sustainable-inspired programs like encouraging people to use their bike or walk, lessening noise levels, increasing eco-food product purchase, reducing carbon emissions from 3.4 tons to less than 3 tons per person, and to combat incorrect recycling processes. Making it to number 1 on the Global Green Cities Index Report of 2014, Copenhagen is already a famous tourist destination because of its stunning sceneries, wonderful castles, and ample attractions. Just like the other top green cities, Copenhagen was chosen due to its dedication to high standards of quality living by efficient environmental means. Additionally, this city is also a European Green Capital title-holder due to the government’s and the citizens’ efforts to achieve and sustain a very clean and hygienic environment. Therefore, Copenhagen can indeed be considered amongst the most remarkable green cities in the world and is worthy of its frequently title as ‘one of the most liveable cities in Europe’. Freiburg in Germany is one of the cleanest cities in the world thanks in part to its uniqueness as a car-free city. We aren’t kidding! In this modern day when almost every city road is congested with heavy traffic due to the increasing number of fossil fuel powered vehicles, Freiburg has remarkably managed to steer clear of motorized vehicles. Freiburg is also proud of its abundance of solar panels that can be seen scattered across the tops of its buildings including schools, local churches, and even the City Hall. One of the city’s main objectives is to continuously cultivate solar energy and to efficiently reduce its carbon emissions by 40% by the year 2030. The capital of Sweden, Stockholm, was actually rated the 3rd greenest city in the 2014 GGEI Report. However, in our list we shift our attention to Malmö, the third largest city in Sweden, and a good model of urban sustainability because of its promotion of renewable energy solutions its abundant green and space. The city is considered one of the greenest in the world because it is home to the world’s third-largest wind-energy park. 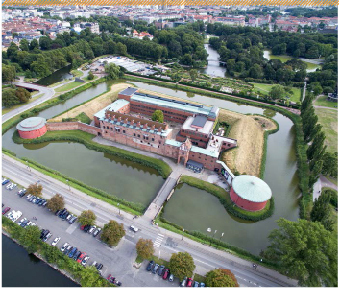 Malmö also has an important objective to make all of its city operations climate-neutral within the next five years. Additionally, the Western Harbour, a district within Malmö, effectively runs on 100-percent renewable energy gathered from the sun, the wind and through hydro power. The neighbourhood also uses biofuels that are efficiently produced from organic waste. The buildings here are constructed using sustainable materials and have been designed and planned to be energy-efficient. Western Harbour is also powered entirely by locally produced renewable energy and it makes use of vacuum waste chutes to keep the streets garbage truck-free. With all the sustainable plans and energy-efficient projects that Malmö is focusing on, the city is aiming to be climate neutral by the year 2020.
the world’s greenest city by 2020. It is certainly a good option for a sustainable destination as it is a centre for clean-technology innovation such as the solar-powered garbage compactors that can be found within the city. Each of these compactors are measured just like a regular trash-can but can hold up to five times the waste. This means fewer emission-spewing trash trucks, low-carbon emissions and increased generation of renewable resources for up to 90 power. 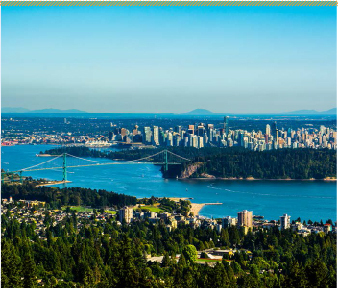 One truly enticing green fact about Vancouver is that it has over 200 open clean parks; making it possible for residents and tourists to really enjoy the fresh Canadian air. San Francisco was the first US key city that banned the use of plastic bag. Furthermore, in October of 2009, the city launched a mandatory recycling program enabling it to keep 77% of discarded water materials safely away from the landfills — this is the highest diversion rate in the US. 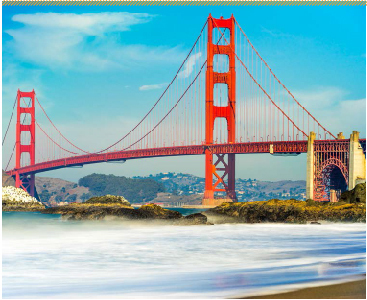 San Francisco is also striving to demonstrate that zero waste is a very attainable and environmentally responsible objective. It has been the city’s pride to announce that the trash collection campaigns have been highly successful and this is thanks in part to the staff that have effectively reached out to educate the residents and business owners on the importance of recycling and compost use in the efforts to create a zero-waste city. 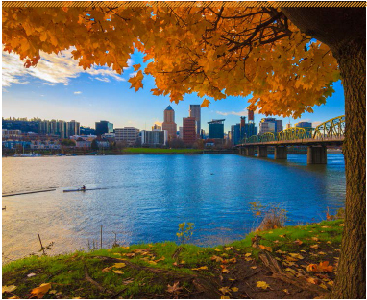 On the number three spot is another US city, Portland in Oregon. 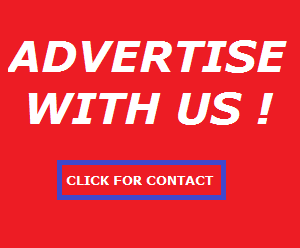 This city does not need too much introduction as – time and again – it has continuously beaten all the other US cities. Being Green has long been on the agenda in Portland, and now the city is focusing more on embracing nature. Local residents are now making it a popular practice to eat locally produced products, to carpool, to recycle and to make the buildings LEED-certified. Portland has efficiently utilised renewable energy resources for up to 20% more than what is being implemented nationally. Just like San Francisco, Portland was also one of the first US cities to ban the use of plastic bags. It also has about 250 miles bike lanes, trails and paths. As a matter of fact, Portland is even named as the United State’s ‘most bikeable city’. 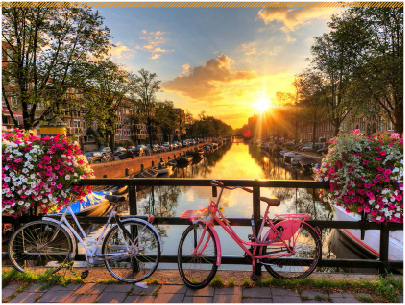 Renowned as one of the most bicycle-friendly cities in the world, Amsterdam has achieved its green objectives largely due to its investment in public health, sustainable urban codes and policies, and a planned transformation of the transportation system. The city has leveraged its naturally flat and compact urban space (similar to Abu Dhabi), and has heavily invested in enabling green infrastructure (one that reminds and guides people to change their ways in the public space). 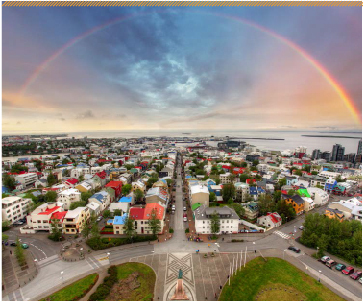 On top of the list as the number one greenest city in the world is Reykjavik in Iceland. Iceland, in itself is a truly unique and charming country with a unique culture. It is no mystery then that one of its cities will make it into the list, and getting the top spot is something to be truly proud of. Reykjavik runs virtually totally on renewable energy. This island state utilises geothermal activity by effectively converted into renewable clean energy. The city also uses only 0.1% of fossil fuels in providing power for electricity. Now, that is a number that has yet to be matched by any other city. Presently, Reykjavik gathers its energy for electricity, hot water and heat from geothermal resources and hydro power. By 2050, it is estimated that the city will be almost entirely independent from using fossil fuel. For those who are not familiar with Reykjavik or Iceland itself, it is worth knowing that being the greenest city in the world, also makes this city one of the most coveted destinations today and for years to come so why not give it a visit?